Srebarna Nature Reserve comprises Lake Srebarna and its surroundings and is located on the bird migration route between Europe and Africa. Srebarna, on the west bank of the Danube River, is a wetland habitat for about 180 bird species, both breeding and migrating. Among the most interesting bird species are the Dalmatian pelican, great egret, night heron, purple heron, glossy ibis and white spoonbill. In advance we had a lot of fun with the inclusion of Srebarna on the itinerary of our 2018 WH meetup. At that time it was the worst rated WHS on our website. Would we be able to collectively raise the score after our visit? Srebarna is a freshwater lake that is an important breeding, transit and wintering place for waterfowl. The lake was originally connected to the nearby Danube - now the two are only connected via a channel. The protected area measures only 6 square kilometers. 75% of it is covered with reeds and other marsh plants. During the preparations, I had tried to arrange a serious birding guide to show us around - but the few English speaking ones I was able to track down were guiding elsewhere (even up to Sofia, perhaps a telling sign). Fortunately we had with us Peter, a fellow world heritage traveller who is also a keen birder. He even had prepared a presentation for us. Through this we became acquainted with the 4 most special birds of this area, that lies on the migratory route along the Black Sea: the Dalmatian pelican, the pygmy cormorant, the glossy ibis and the spoonbill. From the visitor center we first walked down towards the lake. At least, 'in the direction of': around the lake there is a dirt road that you can also drive by car. The trees and shrubs that separate the road from the shore have grown so high that the lake isn’t visible. At a few spots they have made a lookout point, but even there you are still so far away from the lake that you have to have very good binoculars to observe something on the water. Needless to say – we did not see any birds. We carried on following the main road to lookout number 3 - quite an excercise in the hot sun. From there, having seen nothing again, we turned back through the bushes via what once seems to have been a trail. Tree branches regularly block the passage and the grass has grown high. The picnic benches along the route are gradually becoming overgrown with plants. It got better when we followed an arrow with something like 'eco-nature trail' painted on it. This brought us to a higher area, from where there is a good overview of the lake. 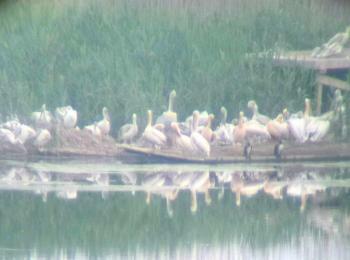 Here you should be able to see the colonies of Dalmatian pelicans. However, we mainly saw swans and ducks (of the kind that you see every day in the Netherlands). Fortunately, at the end we still discovered a highlight on a reed island: a cormorant, which according to our birdwatcher could only be a pygmy cormorant. A 'special' species ticked off after all! A day later, part of our group visited the Danube Delta about 230 km across the border in Romania (I was already there in 2010). Videos of dozens of Dalmatian pelicans taking off from the river flooded our whatsapp group. Without any effort they saw all the species that should also be in Srebarna. The Romanian site was listed 8 years after Srebarna, but shows a so much better example of wetland ecosystems in this part of the world that having allowed Srebarna to become world heritage should actually be considered a mistake. As part of our community meetup in Eastern Bulgaria, we decided to tackle the at the time worst rated site: Srebarna. Srebarna is meant to represent the ecosystem of a contributary lake to the Danube. The Bulgarians also argue that it's a good birding site. When we came, though, birds were in as short supply as were other visitors or tour guides for that matter. Peter was so kind to prepare some material to provide context. But without birds present it didn't help much that day. Indeed, Peter was adamant that Srebarna is not a very unique birding site simply on account of the limited diversity of the bird populations. Size: It's a fairly small national park. No wow factor: The site doesn't have anything outstanding, e.g. a unique species or a great scenery. Accessibility: There are very few trails and it's really hard to explore the site. Upkeep: The site is really in bad shape. Trails are overgrown and several installations have fallen into disrepair. See Els' pictures. To me the accessbility point is the key short coming of the site. You can't even get down to the lake proper. I did expect some learning trails taking you into the different parts of the ecosystem with some explanation boards: "This is a world heritage site and this is our claim to fame!" But no. For birding some dedicated platforms would have helped. 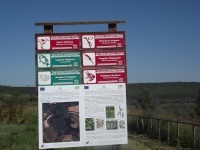 If the Bulgarians need any ideas, Donana NP and Everglades NP could serve as templates. On a certain level I can see that OUV should not be tied to questions as upkeep or accessibility. But it's really hard to appreciate or even just to identify it without. The end result is that Srebarna remains one of our lowest rated sites and deservedly so. PS: The next day Philipp and I made good use of Peter's presentation. The diversity in the Danube Delta is immense and it was kind of hard to spot all the birds; there were just too many of them around. So if you are in the area and interested in wildlife, go to the Danube Delta. I got on a pontoon pushed by a ship from Calarasi, Romania, crossing the Danube / border to Silistra, Bulgaria. 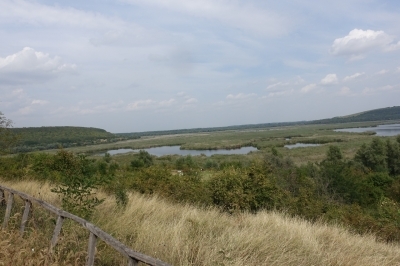 Staying overnight in Silistra, I visited the Srebarna Nature Reserve WHS by bus. The sign at the bus stop for Bus 22 (located at 44°06'49.4"N 27°15'10.8"E) says it runs from 5:15 on but does not say exactly what time. So instead of milling around waiting for the bus at the bus stop, I decided to take another bus from the main bus station a few hundred meters away to the city of Ruse at 9:30 and get off at the entrance to the village of Srebarna. As soon as I got off the bus at the entrance, an old lady who also got out of the bus just waved to the first car she saw to get a ride into the village, and I was at the visitor center/museum for the WHS in no time. I first checked out the museum and then walked out to the lake. There were two groups of pelicans nesting in different shores of the lake. This site is just one lake, so it wasn't as extraordinary and impressive as the Danube Delta. Bus no.22 from outside Silistra station dropped me at the Visitor Centre in Srebarna village. After viewing the exhibits at the centre's museum I set of along several paths, one leading to the lake edge where fishing was in progress. Another path led northwards around the lake, affording views over the lake. At intervals were information boards with maps and details of the wildlife to be found in the vicinity. Yes ,there is no doubt about it that this place is worth a visit if nature is what you are about. The drive from Sofia which takes 5 hours gets nicer as you get closer to SREBARNA in fact the last 15km or so reminded me of parts of Wales (beautiful countryside. The place is looking tired but a new mayor has been appointed 6 months ago (Jan 2008) who is a local of the village and has set about 'tidying' the place up. A place to watch in the furture I think and that was why I bought property there overlooking the lovely lake ! I can conceive of only 2 reasons why a tourist would visit Srebarna, tucked away as it is in NE Bulgaria close to the Romanian border – either you are a keen ornithologist or a keen WHS collector. We fitted both categories and visited it in 2000. 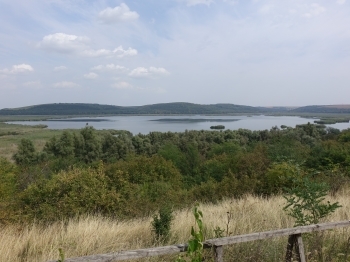 The site, just south of the Danube, consists of a lake (formed from an old ox-bow of the river to which it used to be connected until a dyke was built) and an area of marshes where the land drops at the edge of the eponymous village. Most of it is a “Strict Reserve” and closed to visitors. However, the reserve has an Ecological Research and Visitor Station. The latter is a pleasant facility containing an exhibition of stuffed birds and a terrace with a reasonable view over the marshes When we were there the station was very quiet and perhaps a bit “tired” – the exhibits seemed aimed mainly at groups of school children/students who, no doubt, made up most of the visitors when it was built in earlier “Communist days”. From the station a trail leads to a viewpoint overlooking a pelican colony – this is one of very few breeding sites for the Dalmatian Pelican. The scenery (photo) with its reed beds is vaguely reminiscent of the Danube Delta (less than 200kms away across the border) and the bird list is very similar. In fact most of the birds can be seen in the surrounding area without needing to enter the reserve. Around 100 species of birds nest there and its position on the “migratory flyway” means that another 80 or so visit it but, as the IUCN recommendation states, “its small size means that the quantities of birds are not comparable to other larger wetlands”. Nevertheless, as the recommendation also states, “the site is important on a European scale” and it features in books and articles on “Where to watch birds in Europe”. As would be expected, most of the “wetland biospheres” which make it onto the WHS list are already RAMSAR (Wetland) and UNESCO World Biosphere reserve (WBS) inscribed and Srebarna is no exception. Worldwide there are around 1600 of the former and 480 of the latter and dual designation is not that uncommon. However whether it should also have received the third (and highest?) accolade of “WHS” is perhaps less clear (there are only 160 natural WHS). In so doing it joins undoubted World-class wetland locations like Donana, Pantonal, Danube Delta and Everglades. It is relatively unusual for a natural site to get inscribed on the basis of just 1 of the 4 available criteria (none of the above 4 examples was and I think that, of similar sites, only Ichkeul in Tunisia does so). Yet Srebarna was accepted on the sole basis of Criterion 4 – i.e. it “contain(s) the most important and significant natural habitats for in-situ conservation of biological diversity,” Can this small site really meet even that criterion? The Dalmatian Pelican colony isn’t the biggest in Europe (I believe that is in Greece) and (as far as I am aware) the site lacks the White Pelican (whereas both species breed in the Danube Delta). However Bulgaria has always been very active in gaining WHS inscription from the earliest days of the scheme (8 out of 160 worldwide after 6 years when Srebarna was added in 1983) and also in establishing Biosphere Reserves (it has an amazing 16 sites, only beaten in Europe (not counting Asiatic Russia), I believe, by Spain) so I guess that the inscription is at very least “due reward” for playing the bureaucratic game well! "series of upstream interferences, including the Iron Gates Dam, have permanently altered the natural hydrology of the Danube River in the region and that of Srebarna, located downstream along the river"
Holocene: "At the beginning of the Holocene about 11000 BC right after the so called Flandrian Transgression the riverbed underwent significnat changes .......according to palinological research Lake Srebarna has been formed about 8000 years ago"
59 Community Members have visited. A. Mehmet Haksever Alexander Barabanov Alexander Lehmann Andrew Wembridge Argo Atila Ege Bin Cezar Grozavu Craig Harder Dachangjin3 Dagmara Dimitar Krastev Donald M Parrish Jr Els Slots Erik Jelinek Esther Westerveld Eva Kisgyorgy Fan Yibo Feldhase G. ingraham G.L. Ingraham Gi Hubert Iain Jackson Joel Baldwin John Smaranda John booth Jonas Kremer Jose Antonio Collar Joyce van Soest Judith Tanner Lilia Nesterova MHL Mikko Nan Nihal Ege Nils Kronenberg Pascal Cauliez Peter Loov Petteri Philipp Peterer Randi Thomsen Roger Ourset STEFAN Sabrina Liebehentschel Sazanami Schnitzel Shandos Cleaver Solivagant Stanimir Stanislaw Warwas Svein Heltberg Szucs Tamas Tamara Ratz Thomas Buechler Thomas van der Walt Tsunami Vladimir Walter H.